Please allow me a bit of shameless self-promo, because it involves Kevin Costner. No, he’s not contacted me about filming one of my books (though he should). It’s about one of his older movies. Stay with me. I own so many of your books, so I want to email you about a small epiphany I had. 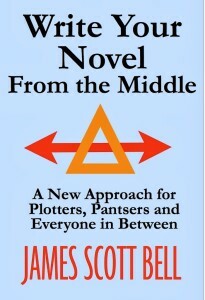 I recently bought “Write Your Novel From The Middle” and, jaded as I am about writing books, read it with some interest but not much conviction. Two weeks later, I’m elbows-deep in the guts of a novel I wrote 7 years ago, and cutting. I mean, I’m slicing and dicing like Freddy Krueger, blood and guts everywhere. I took 20k out of a 127k novel. And there was that weird passage where my main character has a health crisis (he essentially screws up his immune system from overwork, but he thinks it’s something worse) and basically lies flat on his back in his bedroom, waiting to die. And he realizes that due to the path he’s chosen, he’s completely alone on the planet, in London, and nobody cares if he lives or dies. It’s a moment of great weakness, self-pity and the existential crisis that propels him – once he gets better – to really work that human interaction, make friends, network. (He’s in finance, so being good with people is important). Long story short, I really gutted the book, cut that scene down by at least half, and some editors said I should cut it entirely, but for me it was weirdly important. It felt powerful, and it wasn’t the typical “kill your darlings” kind of vanity on my part. I knew it was important, so I only condensed it and kept it in place. The book then went to layout. It was exactly 400 pages in PDF. Guess where that scene fell? Pages 202 and 203. If you take out the front matter/cover, it’s SMACK BANG in the middle. Thank you for putting your writing advice out there. You definitely blew my mind this time. The reason I share this is that this writer’s reaction is one I continue to experience in my own writing as I utilize the mirror moment and writing from the middle. Now, on to Kevin Costner. A few months ago my wife wanted to watch the thriller No Way Out with Costner and Gene Hackman. We hadn’t seen it in ages, so I got the DVD from Netflix and popped it in the player. Halfway in there’s a critical scene involving Hackman and Costner. I paused the DVD. I looked at the counter. We were in the exact middle of the movie. I turned to my wife and said, “Kevin is about to have his mirror moment.” I did not know what it was going to be or how it would be shown. I just felt it was coming. I stopped the movie and smiled at my wife. If you were writing this scene in a novel, you would give us the inner thoughts of the Costner character. He’s thinking along the lines of, “This is too much. I’m dead. There’s no way out of this…” That’s one of the mirror moment tropes. The other is a reflection on questions like, Who am I? What have I become? What must I become? technique. And the great thing is you can do this at the beginning, middle or end of your draft. You can use it whether you’re plotting or pantsing your way through. Anyway, I had to tell you about the Costner thing. Thanks for indulging me. Write well and prosper, my friends! And may the mirror be with you. So here’s today’s question: What’s your favorite Kevin Costner movie? This entry was posted in Gene Hackman, Kevin Costner, Mirror moment, No Way Out, Write Your Novel From the Middle by Joe Moore. Bookmark the permalink. I’ve never really thought about that “mirror moment” but thinking about it, I do have that mirror moment in my WIP. I guess I’ve never noticed how crucial that is before. Man, now I’m gonna be noticing those everywhere. I wonder if video game stories have the same thing? Yes, you will indeed notice it popping up for sure….but the best thing is you can use it yourself. I have your book, and am reading it again as I begin the next story. I’m trying to shift from pantsing to outlining. Thank you for the reinforcement. I’m not familiar with all of his work, but I would go with Bull Durham. Lance, I do think this method is a perfect place for pantsers to get a little more of the outline thing going. It’s not intrusive, it’s flexible, and it fires up the imagination. Jim, I’ve shared with you before how I read your book, then went back over some of my novels and discovered that I’d placed a “mirror moment,” and…they were smack-dab in the middle. Great insight. As for my favorite Kevin Costner movie? Bull Durham. I mean, Kevin Costner, Susan Sarandon, and baseball–can you beat a trifecta like that? Jim, I’ve already made it clear that I’m a fan. But I had a chance to prove your point with a fairly successful author of YA fiction. I was beta reading one of her novels earlier this year. Her protagonist had to decide whether or not she believed the miracles happening to her were really from God (it is secular fiction). But nothing really happened at the midpoint. At some point afterwards, the protag did come to believe, but the gaping hole at the midpoint jumped out at me. I said to my friend, “This is a good story. You can make it a great one with a couple of paragraphs at the midpoint. Use symbolism and have your girl step from the darkness and into the light.” At the midpoint, she even had her character standing outside a well lit revival tent at night. I begged my friend to use that. I don’t know if she’ll take my advice in the final draft, but it’s become very easy for me to see these problems. And they’re usually easy to fix. Rest assured, my man-in-th-mirror moments are the first thing I write down. Good on ya, Ron. Thanks for sharing that. That middle really is a great place to look for a structural weakness…and fix it. Good insights, sir. My favorite Costner film – two of them. Fandango and Silverado. Thanks for this post. I’m a big fan of the mirror moment and the golden triangle. I’ve read and reread your book. And the three point stability of the mirror moment with the golden triangle has become the foundation for planning my stories. It helps me assess at the very beginning what the story is really about. It helps me define the character arc that needs to be shown in order for the story to resonate with readers. And it helps me with the difficult issue of what should be included and what should be cut. A testimonial: (I was going to tell you this at the Central Ohio Fiction Writers conference in October – but since you brought up the subject…) Soon after I read your book, I entered a short story competition. I specifically did what I mentioned above with the golden triangle. I was a finalist, and the story made it into an anthology that will be published in February. I truly believe that your method (writing from the middle) needs to be the foundation before the outlining or the pantsing begins. All I can say, Steve, is wow. Thanks so much for sharing that. Very much appreciated! Funny you should mention this today. I am about to start a “mirror moment” chapter for one of my dual protags. I knew, subconsciously, what it was — these moments are in all my books, I realize now. But I had never heard it articulated as such until your posts. I have been struggling with trying to OPEN this chapter for a full week now because I couldn’t quite hear my character’s thoughts about where he is. But I know he’ll eventually tell me what’s on his mind. I DO know that this pivot-moment takes the plot (and the character arc of course) on a 180-degree turn toward its inevitable end. So thanks for the timely reminder. I am taking the day off to watch football but tomorrow, I can face the mirror moment with faith. As for Costner: Gotta go with Bull Durham. Like Moonstruck, it’s near-perfect scripting. High praise, Kris, thanks. Enjoy the games. And tomorrow, your writing. I checked run time, looked at clock, did quick math and discovered last quarter of movie would begin at 36 after the hour. I looked at friend, told her that the lead characters girlfriend will be killed at 36 after the hour or thereabouts. She looked at me, a flat smirk on her face accompanied a ‘yeah right’ nod. Right at 36 after the hour, BAM!, girlfriend died under a hail of bullets. Friend looked at me slack jawed as I was instantly promoted to guru status. Didn’t take the time to explain the 3 act structure, For mow at least, she pays more attention to me. Moral of story. Structure is very important to flow. I’ll mark out first quarter, midpoint and ending quarter in what I’m reading and am amazed how that timeless structure is followed so regularly. Well said, Fat. And when you can do structure prediction like that, it’s like being a magician performing the cups and balls. Fun to astonish people, isn’t it? This book was recommended to me by another author. I’m a new author, and use this method for everything I write, whether it’s full length novels or short stories. It is an invaluable tool to organize my thoughts, and allows me to see the gaps in the story. In fact, I am sitting here looking at an oversize post-it note on the wall with the big triangle in the middle. One of the best investments in my writing I have made. Thanks, James! That’s so kind of you, LM….I’m really glad it’s helped you thus. Keep writing. I guess you could say I use a mirror moment in my mysteries when there’s a twist that sends the story in a new direction. Good post. That can often work, Nancy. The Costner moment here came right after a major twist. This is a great book! I use it in everything now. I’m even using it while plotting a series. I’m going to have those moments in each book, but also in the middle of the series arc as well. Question: How do you think the mirror moment compares and contrasts to the Dark Night of the Soul moment that comes near the end? Obviously they come at different times in the book, but would you make the Dark Night a failure of the decision they made during the Mirror Moment? I’ve been pondering this and would love your insight. Costner: Maybe not my favorite movie, since Waterworld was epically awesome, but Mr. Brooks was wonderfully creepy. That “darkest moment” in Act 3 is really a plot beat. The mirror moment is a character beat. IOW, by the end the character has been reshaped. Now it’s a matter of that final battle in order to survive. Your idea about having a mirror moment in the middle of the whole series is right on. Go for it! Is the mirror moment a scene that shows the protagonist’s transformation from reaction to action? Did you see the scenes with the broken mirror in A Beautiful Mind? I’m not sure if those scenes took place in the middle of the movie or not. My conception is a little different. I saw A Beautiful Mind, but don’t recall the broken mirror. I’ll look out for it next time I see it. Wow, that’s really cool that you’ve studied this so much you can predict it in quality plots. Well done. You know, I bought this book and it’s still waiting on my Kindle. I’ll be plotting a new book soon. Better read this book stat! It becomes sort of automatic. I once went to sleep on a plane after watching (without sound) the first five minutes of a Matthew McConaughey movie. I woke up twenty minutes later, with my brain telling me the first doorway (plot point 1) was about to happen. I looked at the screen….and it happened. Freaky but kind of cool, too. My son and I often pause movies to discuss plot points. My husband loves when we do this. I’m sure your wife does also! I read this blog post last night and then immediately shut down blogger and pulled up my novel. Of course, I scrolled directly to the middle to see what I would find. Turns out, it is this Big Revelation Moment for my MC. (Shocking!) But, even more so, after I read it I had one of my own. I wrote a scene for this novel (backstory) in 2006. I shelved the whole thing until last year for a list of reasons too long to name here. I used that initial bit as the prologue, then inserted it in Chapter One (in several different places), BUT it always felt necessary and WRONG. Then I read this about the Mirror In the Middle and realized that scene belonged RIGHT THERE… in the middle. It was the natural fit and will actually enrich the story. So, thank you very much for this article. It was a gift!!!! Robin, that is so fantastic. What a nice report and realization. I’m just as excited about this Mirror Moment as you are. Okay, I’m late to the party as usual (’cause I’m editing). First: Tin Cup and I’m a guy who hates golf. I’m a firm believer in the mirror moment. I have a bunch of stuff in progress, but I am going to do one where I start plotting and everything right in the middle and go from there. Should be interesting. Adam, I think you’ll like the results. Have at it! One must be careful how one employes the mirror moment. Stepping through at the wrong time can result in a floating smiley-cats, hookah smokin’ catepillars and beheadings by heartless queens of hearts. But the Hare and the Hatter said it’s okay to be frivolous, as long as one is not late for tea. But I think they’re a bit off…if you know what I mean.